Hello! We’re so glad you’re here. 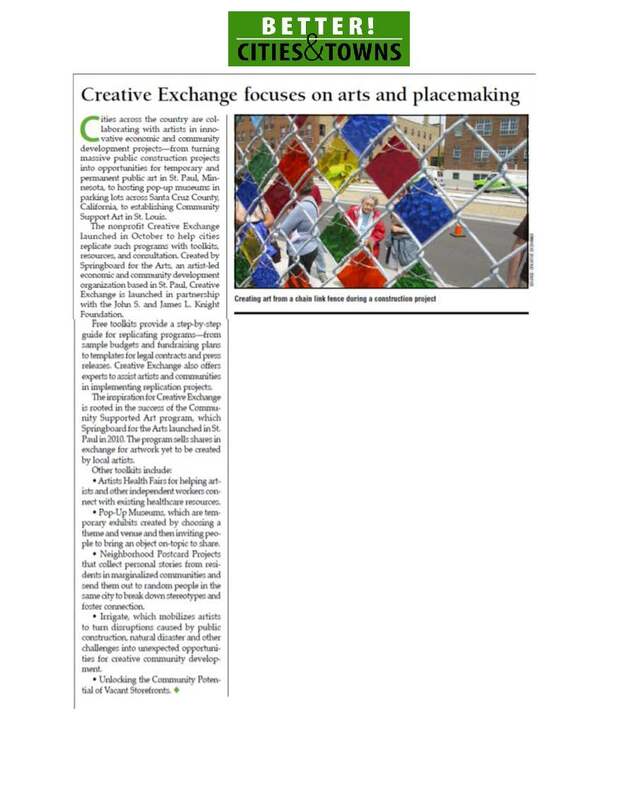 Creative Exchange is a platform sharing artful ideas for stronger communities. Creative Exchange is the national program of Springboard for the Arts, an artist-led nonprofit based in Minnesota. On this platform we share stories of artists and their impact in community, and free, practical toolkits for artist-engaged programs, from professional development to creative placemaking to fun projects to bring people together. By freely sharing our work and creating connections among artists and communities, we work to make substantial, system-wide change. We believe that sharing stories connects and inspires people. We want to share a narrative about the value and creative power of artists. We want to share the successes, strategies and challenges that artists and communities have when working together. And we want to tell stories at all scales, from the artists creating small moments of surprise on their block to the large-scale cross-sector creative partnerships. Find those stories in our profiles of Artists with Impact, and broader explorations in our Special Features. We believe that we can do more when we share more. Across the country, artists, arts organizations, businesses and governments are doing creative, expansive work that is shaping the world we live in. We collect and share practical, proven resources for these creative projects so that you can spark change in your community. Replicate a program like Community Supported Art directly, or use a toolkit as a way to start a conversation with partners. Browse them all, and get your free resources on the Toolkits page. We want people to be connected. A major part of the work of Creative Exchange is to remind you that you are not alone. We share stories and toolkits freely, and you can too. Connect to other readers on our Facebook and Twitter feeds, reach out to the artists you read about, and sign up for our email list. We also host in-person convenings called IdeaLabs and are regular speakers across the country, so keep an eye out for us! You can always drop a line at creativeexchange@springboardforthearts.org. If you are more of a hands-on person, and less of an online interactor, you can hold Creative Exchange in your own hands with our collection Field Notes from Creative Exchange, published in March 2016 to celebrate 2 years of storytelling and resource sharing. You can buy a copy of Field Notes from Creative Exchange, or view it as a PDF. Creative Exchange is the national program of Springboard for the Arts, and receives key funding from the John S. and James L. Knight Foundation, The Kresge Foundation and the Surdna Foundation. Additional support and content partnerships come from the National Endowment for the Arts, the Bonfils-Stanton Foundation, and the Aspen Institute Arts Program. Creative Exchange works with writers, photographers and artists across the country to produce our content. 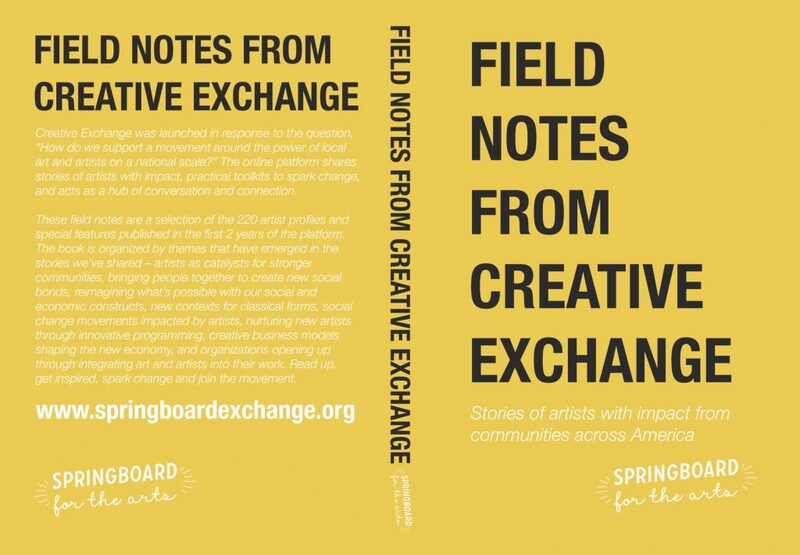 To share your work, or suggest an artist for coverage, email creativeexchange@springboardforthearts.org.